CARMEL, Calif. – Aug 7, 2017 – Ken Eberts, president of the Automotive Fine Arts Society (AFAS), has captured the essence of classic American automobiles and architecture in his latest watercolor and gouache painting, which will debut at the AFAS exhibit during the Pebble Beach Concours d’Elegance on Aug. 20, 2017, from 9:00 a.m. to 4:30 p.m., in Carmel, California. 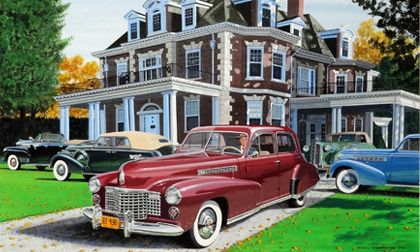 “The Leithiser Mansion on Chocolate Avenue” features four American pre-war automobiles from the William Davis Collection, along with the artist’s personal car. “The Leithiser Mansion on Chocolate Avenue” is a 22-inch by 31-inch watercolor and gouache painting. It celebrates a quartet of American built, “depression era” automobiles including a black ’41 Cadillac convertible sedan, a maroon ’41 Cadillac Fleetwood Sixty Special, a green ’35 Cadillac LaSalle and a ’38 Buick convertible sedan. Eberts’ personal vehicle, a blue ’38 Buick Special Touring sedan, is also shown in the painting. “The Leithiser Mansion on Chocolate Avenue” includes Mr. Davis in the 1935 Cadillac LaSalle, wearing his signature hat. The painting will serve as the poster artwork for the Hershey Antique Automobile Club of America’s show, which will be held Oct. 4 -7, 2017, in Hershey, Penn. ; it is considered one of the largest and most prestigious antique automobile shows in the United States. One of this generation’s foremost automotive fine artists, Ken Eberts’ artwork, has been featured at the world’s most prestigious automotive events. His paintings have been reproduced as magazine and book covers, Christmas cards, prints, and used as posters for automotive events since 1968. A graduate of New York’s High School of Music and Art and Los Angeles’ Art Center College of Design, he began his career as an automotive designer for the Ford Motor Company. He earned countless prestigious awards over the years. In 2003, Eberts was named Ford Motor Company’s official Centennial Artist and was commissioned to create 13 original paintings for use as a calendar and other products that celebrated Ford’s 100th Anniversary. Ken is a one of the original founders of the Automotive Fine Arts Society, and has been its president since its inception. The AFAS Exhibition has been an important part of the annual Pebble Beach Concours d’Elegance each since 1983. AFAS was established in 1983 by a group of artists who are acknowledged by critics to be among the best in their field. Members work in many diverse mediums including oil, watercolors, acrylics, wood, gouache, pen & ink, clay and metal. AFAS and its members participate in select shows across the country including the Pebble Beach Concours d´Elegance, Dana Point Concours d’Elegance and the Amelia Island Concours d´Elegance. Information about AFAS is available at www.autoartgallery.com.